Former Perfect Heart member (and fellow Memphian) Dale Shipley has announced that he will begin doing some select solo dates (hat tip, DJM). He is being booked by Duane Garren, and has a new CD coming out. More information is available at www.daleshipley.com. Dale has long been one of my favorite singers, and if you have never heard him from his time with Perfect Heart, he has one of the most outstanding lead voices that has ever come along in Southern Gospel music. Daniel posted a great video from Perfect Heart on his post about Dale, so I’ll change gears. After leaving Perfect Heart, Dale was an oft-featured soloist with the Bellevue Baptist Church choir here in Memphis. Bellevue is the church that was pastored for many years by Dr. Adrian Rogers. I used to watch their telecasts early on Sunday mornings while getting ready to head to my own church, and I heard Dale sing this song many times with their choir. Here is a video from a Bellevue telecast of Dale singing “The Anchor Holds”, which, coincidentally, is on the CD available on Dale’s site. This was Perfect Heart’s second live album, and is very easily overlooked for their first, Live, which had several songs from their debut project, and some assorted classics and Funderburke sugar sticks from the Cathedrals days, or the later Live At The Forum, which was a much more produced album than this one. This project has more in common with its predecessor, as it primarily is accompanied by piano, bass, and drums. There are tracks used on a very few cuts. However, what the album lacks in production it makes up for in performance quality. By this time, the group had really hit its stride, and this album consists primarily of selections from their Looking For The Wounded project. There are standout performances of “In My Wildest Dreams”, “Glory Waves”, “The First Look” and “I Wish It Would Rain” among others, but there are a couple of extra songs thrown in for good measure. A nice rendition of “I’ve Been To Calvary” opens the disc, and “He Will Come Back” from the debut album, It Comes From The Heart, finds its way onto a live album here. The real notable performance here is that this is the only place you can find Perfect Heart singing Mark Lanier’s original “While He’s Molding Me He’s Holding Me”, which was featured here as a Hidden Gem. This album may be forgotten, but it’s worth pulling back out for a couple of listens if you have it, and if you don’t it’s worth scouring ebay or Amazon to find a copy. It’s a very enjoyable live performance from a fantastic quartet. Here’s a real jewel from the original Perfect Heart captured in a live concert. I’ve always thought that this group had the best arrangement of “In The Sweet Forever”, and the key change and harmony inversion at the end is incredible. No tracks, no stacks, and no studio overdubs. Just a piano, bass, and 4 voices. This is what an elite quartet is supposed to look and sound like. This song came from 1995’s Sonlite release, On Time God. 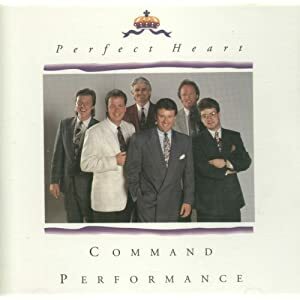 I believe this was the first project with the lineup of Garry Sheppard – Tenor, Dale Shipley – Lead, Mark Lanier – Baritone, Mike Presnell – Bass, and Jeff Stice – Piano. This is a tender, almost pop sounding ballad that makes you think of “Somewhere Out There”, the pop song from the movie An American Tail. This song has a little bit of a similar musical feel to it, as well as the similarity in the title. Garry Sheppard sings the lead on the song, and though I’ve never been much of a Garry Sheppard fan, he does a fantastic job on this beautiful song. Sheppard sings the verses solo, then the rest of the group joins on the choruses in some of the highest harmony you’ll ever hear on a Perfect Heart recording. The harmonies are gorgeous, with a nice tag that contains some incredible chord changes. This is simply one of the most beautiful songs that Perfect Heart ever recorded. If you’ve got a copy of this, pull it out and give it a listen. As this was on Sonlite, I’d love to see Crossroads rerelease this album digitally. With the return of Perfect Heart, I was reminded of a routine they did when I saw them in concert once. The personnel was tenor Garry Sheppard, lead Dale Shipley, baritone Darren (? ), bass Mike Presnell, and pianist Jeff Stice. Garry starts out saying he always wanted to be a bass singer or how singing bass was easy and he wanted to do it so they all swapped around. Garry moved to bass, Presnell moved to lead, Dale moved to baritone, Darren moved to piano (had a funny joke asking if the sustain pedal was a gas pedal) and Stice moved to tenor. They sang “Have a Little Talk with Jesus.” Instead of singing the low bass notes, Shep would blow a raspberry. It was pretty hilarious! The Perrys did something similar when they first went to the 3 male/1 female lineup. They did a male quartet where their lead singer Loren Harris went to bass, bass singer Tracy Stuffle went to tenor, baritone Curt Davis went to the piano, pianist Dennis Horton sang lead, and the bass player Jamie Bramlett sang baritone and played bass. I’ve seen on some Statesmen videos where Doy Ott would go to the piano and Hovie would join the other vocalists mid song. According to Aaron Swain’s blog, Mike Presnell is bringing back Perfect Heart. The group already has a website, and personnel are Wesley Anders – tenor, Jimmy Dunn – lead, and Tommy Smith – baritone. Smith is a former member of Cross4Crowns. Based on the clips that are on the website, these guys have a really nice sound, and the lead singer is a bit reminiscent of Dale Shipley. Count me in as one glad to see the name Perfect Heart back! From the Command Performance live album from around 1993 comes this midtempo song written and sung by Mark Lanier. As far as I know, this is the only recording of this song, and it’s a nice one. Lanier does a smooth job on the verses, while the group provides some nice harmonies on the chorus. The tag is the last line of the chorus repeated a few times with Dale Shipley taking the last repeat up to a nice power ending that has a classic staggered resolve to the tonic chord. 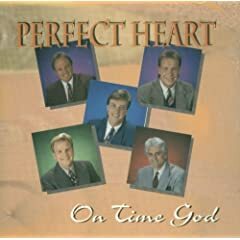 This is done live with just piano, bass, and drums, and really showcases the strength of Perfect Heart as a quartet. I really miss these guys. Great song by a great quartet.